This is a modified, shorter version of the console game ported to Microsoft Windows and released in selected countries (Russia, Germany, Poland, France). This is also the first game that the Rabbids become allies with the player. 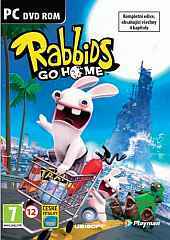 It's the fourth installment in the Rabbids sub-series of the Rayman series of video games and is the first stand-alone title in the sub-series. The game's plot centers on the efforts of the titular Rabbids to collect as many human objects as they can and create a huge pile high enough to reach the Moon, all the while avoiding the extermination attempts by the "Verminators", who wish to gain back the stuff the Rabbids have stolen.